Another feature that irked me was Howe's random descriptive passages. I like authors writing lush books using lush language. But I feel that sometimes, it can seem forced. Saying that a voice "floats in sans serif font" seems forced to me. Personally, I feel this book is going to get really good reviews due to all the hype surrounding it. And I'm not saying that it wasn't good- it was entertaining and fun to read, though I think it could do with some more editing. The premise of the book is intriguing on its own- a novel written from the assumption that the accused witches of Salem were truly witches. Interestingly enough, this is not a take that I have seen before (Has anyone elseread books with this premise? Good ones?). And the historical parts are compelling. In fact, I much preferred the historical interludes to the modern-day ones. Modern-day being 1991. I'm not entirely sure why Howe decided to set her story in 1991 instead of in 2009; that's a question I'd like to ask her. 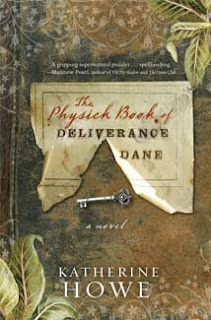 And generally, I think if you enjoyed The Historian, you will enjoy The Physick Book of Deliverance Dane. Also, I think anyone who has the tiniest inkling of interest in American colonial history will be unable to withstand the plethora of marketing around this book. So go for it, and enjoy. And for those of you East Coasters, please let me know if you think the book embues that "New England" personality. Thanks for the review. I know a lot of books were received in blog land this past week. I would really like to read this. Thanks again. I loved The Historian, so I guess this is the book for me then? After all the adverting and anticipation, I was very disappointed with The Historian. I was excited about this book, but now I think it will be a lower priority on my list. Thanks Aarti! I am reading this one in a few weeks. I read The Historian, and thought it was ok, but not great. I had been a bit excited to read this one, but not so much anymore. I'm happy to have read your honest reactions to it. Hype always kills it for me. It does sound intriguing though.